Definition - What does Side Plank Pose mean? Side plank pose is a challenging posture that strengthens the abdomen, legs and arms, as well as promotes mental focus and balance. To enter the pose, begin in a strong and well-aligned plank pose. Then roll the body to the left, lifting the left arm overhead. Once balanced, stack the feet at the arches. The gaze is up at the left hand. Once strength and balance is developed, the yogi may attempt the full expression of this pose by lifting the left leg into the air or gently grabbing the left foot with the left hand and lifting both together. Repeat on the opposite side. 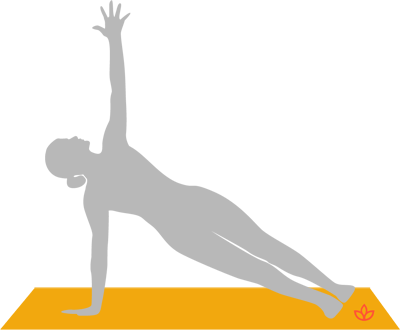 Side plank pose is also known as Vasisthasana in Sanskrit. Side plank pose increases balance while toning the abdomen (especially the side) and strengthening the legs and arms. It stretches and strengthens the wrist and can help prepare practitioners for more advanced arm-balancing poses. This posture is often considered one of the best poses for strengthening the abdominal muscles, which can assist in improving posture as well as protecting the spine over time. Side plank pose's Sanskrit synonym, vVasisthasana, means "wealthy pose." In Hinduism, Vasistha was a saint who possessed a divine cow and her children could grant whatever their owners wished, which made Vasistha wealthy. Likewise, side plank pose can help the practitioner feel powerful and confidently wealthy as he/she notices his/her balance and abdominal strength improving over time.